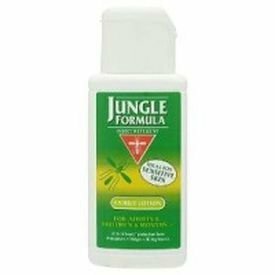 Jungle Formula Lotion is used to protect you from mosquitoes, midges and other biting insects, giving you lasting protection. Jungle Formula Lotion is used to protect you from mosquitoes, midges and other biting insects, giving you lasting protection. Ideal to use in hot climate countries. Recommended by Doctors and Hospitals to be used in tropical areas where the risk of malaria and other insect transmitted disease is at high risk.